About this magazine: This magazine is for automobile enthusiasts interested in domestic and imported autos. Each issue contains road tests and features on performance, sports, international coverage of road race, stock and championship car events, technical reports, personalities and products. Road tests are conducted with electronic equipment by engineers and journalists and the results are an important part of the magazine's review section. Motorcyclist magazine covers the full spectrum of street motorcycling including cruising, touring and commuting. Each issue of Motorcyclist magazine features road tests, how-to articles, race coverage and legislation updates. This magazine is written for automotive enthusiasts and emphasizes cars and driving blended with wide-ranging feature stories, entertainment and event coverage. 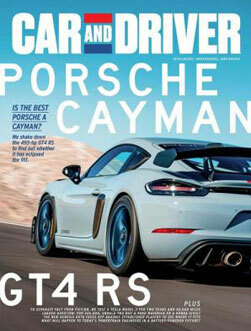 Its road tests run the gamut of domestic and imported sports cars and sports sedans. Additionally, it features technical articles on automotive subjects, nostalgic feature articles, humor and fiction and analysis of industry trends along with travel stories, book reviews and coverage of international racing events.